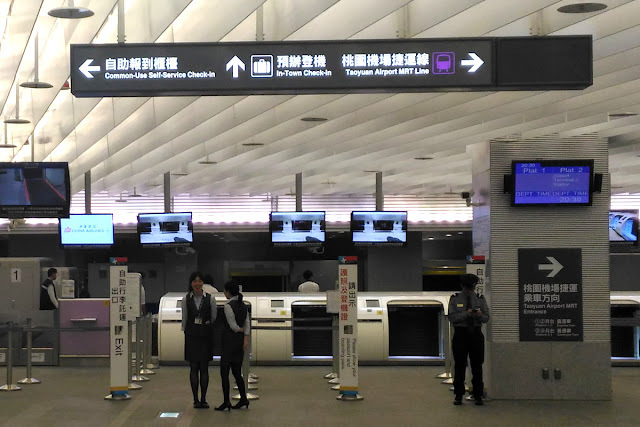 After twenty years of planning, ten years of construction, six delays and a trial period, Taipei's new Airport MRT finally opened to the public on March 2nd, 2017. The modern, spacious MRT station stretches between Taipei Main Station and Beimen Station on the green Songshan-Xindian line. This connects the airport line with most of Taipei's MRT lines, the conventional trains, the high speed rail and Taipei Bus Station. An underground "kiss and ride" taxi station is located just outside the station gates. The MRT trains themselves very much resemble Taipei's other MRT lines (which they are), except for the novel new purple (express) and blue (commuter) colour schemes, and luggage racks in each carriage. The MRT station itself, however, feels more like an airport than a subway station, complete with moving walkways and even an "in-town check-in terminal", where passengers flying on Taiwan's own China Airlines and EVA Airways can check in their bags and then take the new MRT to the airport and go straight to their departure gate. In-Town Check-In is available for flights on Taiwanese airlines (China Airlines, EVA Air and subsidiaries). Passengers headed to Taoyuan International Airport should be sure to take an express train, which makes the journey in a mere 35 minutes, stopping off only at New Taipei City Industrial Park, Chang Gung Memorial Hospital and both airport terminals. The commuter trains stop at ten stops before the airport, and then continue on for another eight stops, including Taoyuan High Speed Rail Station. The entire 51-kilometre journey from Taipei Main Station to the terminal at Huanbei Station in Jhongli takes around seventy minutes. After the first month's 50% discount finishes, tickets from Taipei Main Station to the airport will cost NT160, about as much as the HSR and shuttle bus and not a lot faster, but without the hassle of the transfer from Taoyuan HSR Station to the airport shuttle bus. Buses, by comparison, usually cost around NT125, and take around forty minutes in good traffic. A new MRT will eventually connect the Huanbei Terminal with Jhongli Train Station. The trains, which were made in Japan and Taiwan by Kawasaki, have a maximum speed of 100km/h. The total construction cost was NT114 billion (3.6 billion US dollars). 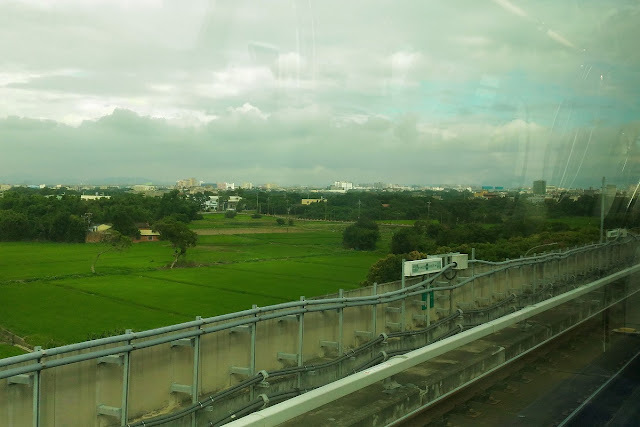 The airport MRT offers some good views over the Taoyuan and New Taipei City countryside.